2014 Leaf Originals Wrestling crosses multiple eras of champions, all-time greats and memorable performers. The all-autograph set comes with five cards per box. 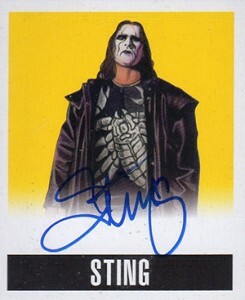 Among the signers are Hulk Hogan, Sting, Trish Stratus, Ric Flair, Jeff Hardy, Roddy Piper and Jake Roberts. King Kong Bundy, The Dynamite Kid, Terry Funk and Ole Anderson are among the wrestlers getting their first autographed trading cards. 2014 Leaf Originals Wrestling also has some athletes with limited experience in the ring. Mike Tyson and Dennis Rodman are among them. Base autographs have a similar design as 2012 Leaf Originals Wrestling. The big difference is the artwork. Steve Stanley, who has a history of working with wrestling promotions like WCW, has contributed the art this time around. Besides base autographs, there are also dual autographs done with the 1960 Leaf design highlighting some of Ric Flair's most iconic opponents. Redemptions for the original artwork is randomly inserted. Unless noted otherwise, Short Print designations refer only to base autographs. Awesome value for the price. Great art. great list and great art! i will be buying a box or more myself! My breaks have been great. Love this product…especially the Hot Boxes!